Evensville, TN — Rhea County continued with three game home stand before going on the road to White County on Friday. On Tuesday, Lady Eagles put on the gas in the third quarter to win 70-57 against a pesky Warren County and Eagles fought hard but came up short 62-57 against Warren. Eagles played Warren earlier in the season at the Sonic Shootout in December in game won by Warren 55-46. Lady Eagles and Warren played close throughout the first quarter with Lady Eagles taking lead 20-18 after quarter’s end. Second quarter was much the same as Warren led late until Macy Welch hit late three for the 33-33 tie at the half. In third quarter, a Welch three put Lady Eagles up 42-37 and Haley Cameron’s basketball kept Rhea County in lead 48-42 with 3:31 left in quarter. 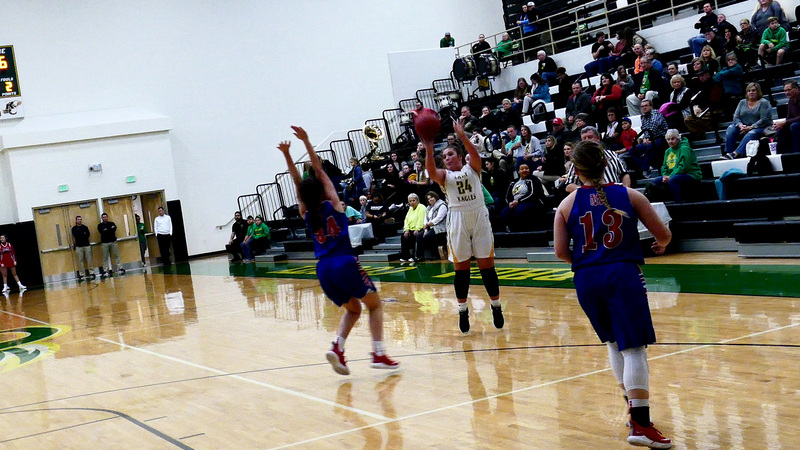 Rhea County continued with burst with Taylor, Cameron, Welch as Eagles outscored Lady Pioneers 26-12 in third quarter for 59-45 and Macy Welch had 14 of those points. For the quarter the Lady Eagles hit five three point baskets. Lady Eagles continued good play and Mallory Hampton basket with 5:43 left in game, Lady Eagles led 63-48. Warren made a minor comeback to get back to ten point deficit on a couple of instances but Lady Eagles held strong for the 70-57 win. Macy Welch and Haley Cameron each scored 16 second half point to lead the Lady Eagles and finished with 23 and 19 points respectively. Mallory Hampton joined the two in double figures with 12 points. Also scoring for the Lady Eagles: Maddie Smith 6, Maddie Taylor 6, Sarah Conley 2, Emma Gentry 2. Eagles began with early lead and battled as teams stayed close throughout the quarter down 15-14 at end of first quarter with Laws and Guthrie scoring 5 and 4 points to lead the way. Margin remained slim throughout the second quarter and stood at 22-22 after Kade Vincent hit two free throws with 1:45 left in half. A late basket by Warren put them up 24-22. Eagles finished out half with baskets by Kaleb Laws, and Drake Taylor late for the 26-24 lead. Kaleb Laws led Eagles in half with 11 points. Warren outscored Eagles 15-8 in third quarter to take 39-34 lead going into the last quarter and Eagles were still in contention going into last quarter. Guthrie and Laws picked up baskets down low to cut the lead to 39-38 with minute gone in quarter before Taylor answered with elbow three to push lead to 42-38. After a almost two minute possession by Pioneers failed to yield results, Laws hit short jumper to pull Eagles within 42-40 with 4:20 left in quarter. Laws grabbed a rebound with just over three minutes remaining and Eagles were in possession looking for tying three when a rather unfortunate five county gave ball back to Warren. After another patient possession by Warren, C.J. Taylor took advantage of a screen by Eagle player who was pushed into Laws allowing the drive to basket and Taylor made the basket. He also made the and-one free throw to give Pioneers 46-42 lead with 1:46 left in game. Eagles came down and scored two free throws by Guthrie with just over one minute remaining. Eagles made the stop and came down and scored on Laws jumper to cut lead to 46-44 with minute and half remaining. Pioneers were once again milking the clock when Eagles over aggressive defense sent Smith to line for free throws. Smith calmly nailed both free tosses to push Warren up 48-44 with 55 seconds remaining. After Eagles did not score on their end they were forced to foul Smith, who sank two more free throws for 50-44 lead with 48 seconds left in game. Drake Taylor stepped up with long three from head of key to cut lead to 50-47 with 27 seconds remaining. Eagles went into press and Pioneers leaked player behind press and made the easy basket for 52-47 lead with 21 seconds remaining. Eagles quickly retrieved the ball out of basket and got ball into thier end but could not get a good shot and the off balanced jumper was rebounded by Warren as time ran out. Another tough loss for the Eagles at home and now they go to play in the always tough home Gymnasium against White County on Friday night. The Warriors and Eagles will be looking for their first district win and will be a battle. The Warriors like the Eagles have lost two last minute games recently with 68-66 loss to Cookeville and 56-55 loss to Stone.